78 Landscape Architect and Specifier News G o t o L a n d s c a p e O n l i n e . c o m a n d s e a r c h L a Q u a t r a B o n c i A s s o c i a t e s t o v i e w m o r e f i r m p h o t o s LaQuatra Bonci Associates Pittsburgh, Pennysilvania Mellon Park Walled Garden Pittsburgh, Pa. LBA collaborated with artist Janet Zweig to reimagine the historic Mellon Park walled garden as a memorial to the life of Ann "Annie" Katharine Seamans. LBA provided design services including installation oversight of the garden space which uses 150 fiber optic "stars" to reflect the sky on Annie's birth date. This public garden is designed for all-season interest as plants showcase themselves in different forms throughout the year, and the in-ground constellation of stars bring the garden to life at night. 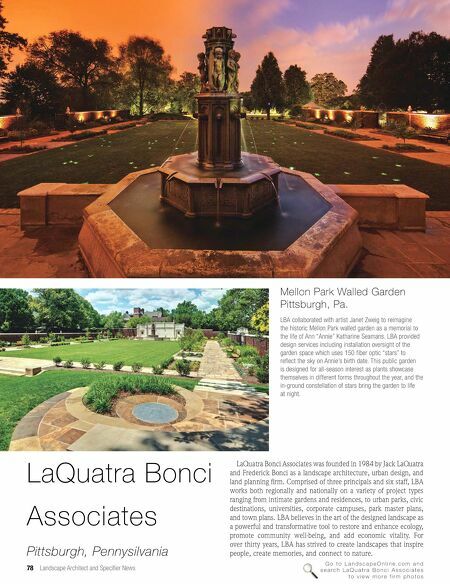 LaQuatra Bonci Associates was founded in 1984 by Jack LaQuatra and Frederick Bonci as a landscape architecture, urban design, and land planning firm. Comprised of three principals and six staff, LBA works both regionally and nationally on a variety of project types ranging from intimate gardens and residences, to urban parks, civic destinations, universities, corporate campuses, park master plans, and town plans. 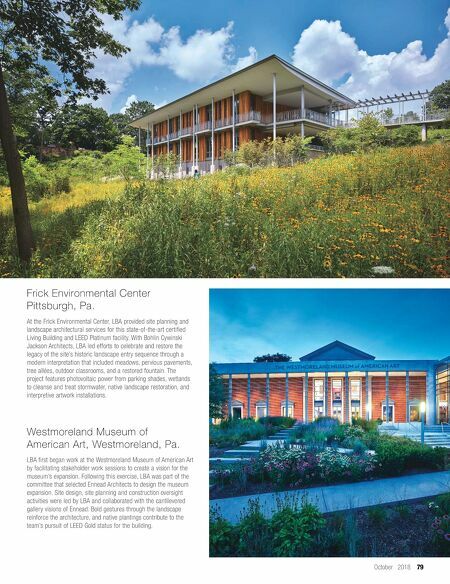 LBA believes in the art of the designed landscape as a powerful and transformative tool to restore and enhance ecology, promote community well-being, and add economic vitality. For over thirty years, LBA has strived to create landscapes that inspire people, create memories, and connect to nature.